Curtis, Alan (Chandler) - Book Appointment Online! We are always excited about meeting new patients during their first visit to our office. Your initial appointment will consist of a thorough examination and a discussion of potential treatment options. This important 60 minute visit will give us insight into your orthodontic needs and wants. We know your time is valuable, so to expedite treatment, we ask that you fill out the "New Patient Forms" listed below, and submit them online. If treatment is indicated at the time of the exam, we may also reserve time following the exam for diagnostic records. This is how all doctor offices should operate. I received a referral from our regular dentist office, Jones Family Dentistry that is also top notch and operate in the same format. Smiling faces, professional, organized, technologically advanced office...waiting for you when you arrive. 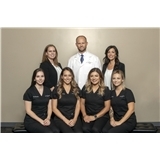 Dr. Curtis explore all options for the patient to choose what they feel is best for their situation, and then have a discussion about treatment. Just an overall "high five" to Dr. Curtis and his supportive staff.